Friday’s sale saw some very high prices for cattle. The weanling section recorded a top per kilo of 265 pence for a 268k Lim @ £710. This was obtained by a Ballynahinch farmer who averaged over £2.00 per kilo for seven males and females. An Annaclone farmer sold a 238k PTS male calf @ £630, again 265 pence per kilo. In the bullock section, 40% of it sold at or above the £1000 mark, e.g. 612k @ £1100 for a Kilkeel farmer. Rathfriland farmer 664k @ £1100. Bullocks reached 209 pence per kilo for a 480k Ch @ £1005 for a Ballykeel. Store heifers sold to £1095 for a Kilkeel farmer. Dropped calves were a great quality. 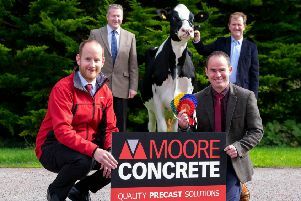 A Ballyholland farmer reached £305 for a Lim Bull and a Derrylecka farmer £290 for a Sim bull. Angus bulls also sold to £290 for a Rathfriland farmer. Two Blonde breeding bulls from Rathfriland sold @ £1120 and £1100. DROPPED CALVES: Ballyholland farmer £305, £280, £260. Derrylecka farmer £290, £260, £210 and £210. Glenhorne farmer £290, £275, £275. Katesbridge farmer £270, £230, £220 and £200. Kilkeel farmer: £235. Lisduff farmer £230. Rathfriland farmer £200. WEANLINGS: Annaclone farmer 390k @ £840, 370k @ £830, 434k @ £830, 371k @ £830, 386k @ £730 and 238k @ £630. Mayadd farmer 374k @ £750, 388k @ £720, 380k @ £695, 340k @ £635, 378k @ £600, 296k @ £580. Lisnaduff farmer 360k @ £695, 322k @ £745, 365k @ £695, 342k @ £665, 308k @ £620, 296k @ £600. Millford farmer 324k @ £620, 288k @ £585, 288k @ £575. Ballyroney farmer 363k @ £735. Ballynahinch farmer 268k @ £710, 234k @ £530, 280k @ £550, 258k @ £500, 296k @ £580, 258k @ £500, 226k @ £450, 246k @ £450. HEIFERS: Kilkeel farmer: 630k @ £1095, 580k @ £900. Newry farmer: 538k @ £920, 470k @ £890. Castlewellan farmer: 488k @ £885. Warrenpoint farmer: 460k @ £780, 398k @ £770, 460k @ £725. Newcastle farmer: 380k @ £620, 326k @ £540, 306k @ £500, 312k @ £500, 260k @ £440. BULLOCKS: Rathfriland farmer 664k @ £1100, 612k @ £1100, 634k @ £1085, 584k @ £1045. Ballykeel farmer 506k @ £1040, 514k @ £1020, 480k @ £1005. Kilkeel farmer 612k @ £1100, 548k @ £1025. Edenagarry farmer 528k @ £1000, 520k @ £850, 492k @ £830. Legannany farmer 602k @ £1025, 576k @ £995, 364k @ £620 etc. Friesian bullocks to £815 for 604k. 1200 sheep on Tuesday evening saw 750 spring lambs ease in price slightly with a top of £91.50 paid to a Ballymartin farmer for 22.5k. A Kilkeel farmer also sold 25k @ £91.50 and a Cookstown farmer 26k @ £91. 344 fat ewes sold to £108 for 7 Charollais from Cascum. A Kilkeel farmer sold ewes to £107. 54 hoggets sold to £77 for a Cabra farmer. Breeders sold to £204 for a 3 year old ewe with 2 lambs at foot from Warrenpoint. 750 LAMBS: Ballymartin farmer 22.5k @ £91.50. Kilkeel farmer 25k @ £91.50. Cookstown farmer 26k @ £91. Ballybrick farmer 23.5k @ £89.50. Tierkelly farmer 32.5k @ £89. Armagh farmer 22.5k @ £89. Newcastle farmer 23k @ £89 and 22k @ £89. Ballinaskeagh farmer 23k @ £89. Ballyward farmer 22k @ £88.50. Rostrevor farmer 19k @ £78. Hilltown farmer 22k @ £85.50. 344 FAT EWES: Cascum farmer £108. Kilkeel farmer: £107. Ballykinlar farmer £95 and £85. Cookstown farmer £94. Hilltown farmer £91. Ballyward farmer £95. Altnadue farmer £87 and £85. Mayobridge farmer £84. HOGGETS: Cabra farmer £77 and £73. Aughnaskeagh farmer £75. Dromara farmer £71.50 and Downpatrick farmer 2 lots @ £67.50 and £67. BREEDERS: There was a great trade for a three year old ewe and two lambs from Warrenpoint which reached £204. Others with two lambs at foot sold from £178 to £185. Ewes with singles to £148.